The Mayor of London Boris Johnson has today joined forces with Procter & Gamble (P&G), Worldwide Partner of the London 2012 Games, to deliver the Mayor’s annual Capital Clean-up campaign, now titled the P&G Capital Clean Up. Over the next three months a series of clean up events designed to bring Londoners together to spruce up neglected areas of the city will be hosted as London gears up to host the greatest show on earth this summer. Supported by prime time actress Keeley Hawes (Upstairs Downstairs / Ashes to Ashes), the P&G Capital Clean-up will be taking place across London from March to June 2012 and an army of around 1,700 community champions is expected to join the transformation, dedicating up to 5,000 hours to scrubbing, sprucing and polishing London’s streets and green spaces. Some of the UK’s most recognisable household brands – Flash, Febreze and Ariel detergent and stain remover– are behind the P&G Capital Clean-up and committed to working with the Mayor of London, the GLA, and Londoners to help add sparkle to our host city full of heritage and culture ahead of the London 2012 Games. 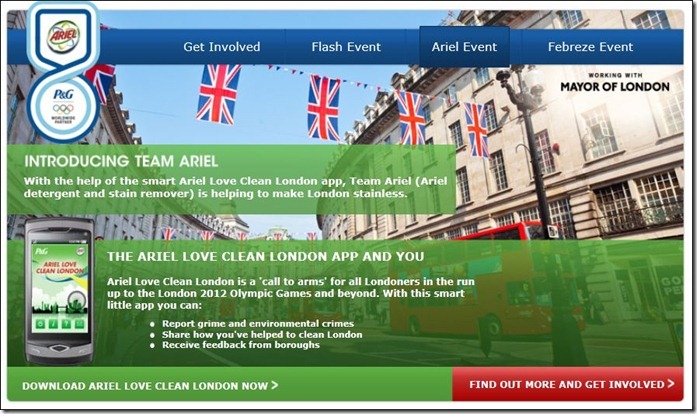 Categories: street litter | Tags: Ariel, Ariel Love Clean London, boris johnson, LCS, love clean london, Love Clean London app, love lewisham, mayor of london, The Olympics | Permalink.